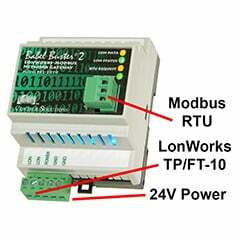 The Babel Buster BB2-2011-NB LonWorks to RS-232 Modbus gateway is used to connect LonWorks devices to a Modbus RTU RS-232 master without binding or LonWorks network management outside of the gateway’s own capabilities. A large number of data objects gives you flexibility in mapping Modbus registers to scalar or structured LonWorks network variables. Multiple registers may be mapped a single structured LonWorks network variable. Modbus holding registers, input registers, discrete inputs, and coils are supported. 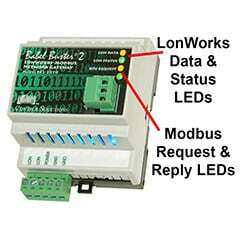 The BB2-2011-NB LonWorks to RS-232 Modbus gateway will periodically poll LonWorks network variables to read LonWorks data, or write network variables upon change in value (or periodically if chosen). Data read from LonWorks will be placed into Modbus registers. Data written to Modbus registers will be written to LonWorks network variables. 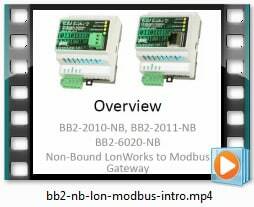 The BB2-2011-NB puts a LonWorks device on a Modbus network. Do you need to put a Modbus device on a LonWorks network instead? If so, you want the BB2-2011 (no -NB). 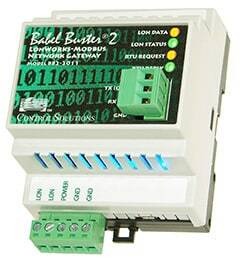 Control Solutions’ Babel Buster BB2-2011-NB is a Modbus master/slave used to connect LonWorks devices to a Modbus network without binding or LonWorks network management outside of the gateway’s own capabilities. A large number of data objects gives you flexibility in mapping Modbus registers to scalar or structured LonWorks network variables. Multiple registers may be mapped a single structured LonWorks network variable. Modbus holding registers, input registers, discrete inputs, and coils are supported. The LonWorks network variables will be polled periodically to read LonWorks data, or updated upon change in value (or periodically if chosen) to write LonWorks data. Data read from LonWorks will be placed into Modbus registers. Data written to Modbus registers will be written to LonWorks network variables. 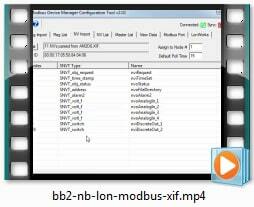 The BB2-2011-NB is most often used as a Modbus slave, providing LonWorks data to a Modbus master such as a control system PLC. 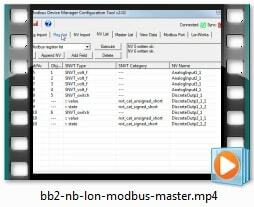 The BB2-2011-NB can also be configured as a Modbus master, automatically reading and writing Modbus registers in other Modbus slaves to share LonWorks data. The BB2-2011-NB provides poll 400 data objects which may be accessed as any of the standard Modbus register types. These 400 registers may be mapped to as many as 300 LonWorks network variables, with multiple Modbus registers often mapped to a single LonWorks network variable. The Device Manager Configuration Tool is a user friendly LonWorks gateway configuration that runs on your PC. Connect the gateway to your laptop via a USB cable - no need for any adapters or “dongles”, and no need to have a functional network on either side of the gateway for initial setup. 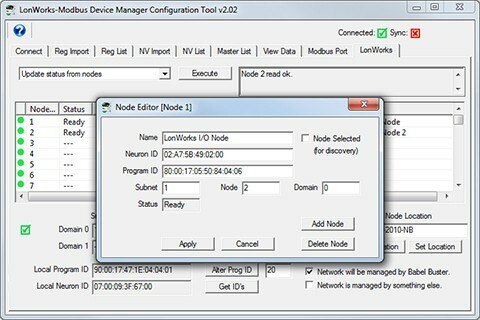 The Device Manager Configuration Tool can import XIF files that define the network variables in the LonWorks device to be connected. The configuration tool also has the ability to import the XIF (program interface) information directly from the LonWorks device in most cases. The Device Manager Configuration Tool will save your configuration to an XML file as backup, and to replicate the same configuration in additional devices with a simple file download. The BB2-2011-NB can poll up to 300 LonWorks network variables, each having up to 31 bytes of data. The BB2-2011-NB provides up to 400 Modbus registers which are used to exchange data with the LonWorks network variables. Many LonWorks network variables are a single data value, such as temperature. However, many other LonWorks network variables are ‘structured’, meaning a single variable contains several related data values such as in the HVAC status variable. Modbus registers, on the other hand, always contain exactly one and only one data value. This means a single structured LonWorks variable cannot be translated to a single Modbus register. The single structured LonWorks network variable must be translated to or from multiple Modbus registers. 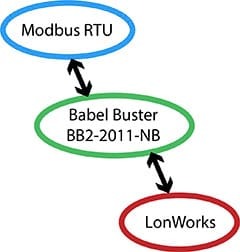 The method of making structured LonWorks data available to Modbus involves intermediary data ‘objects’ in the Babel Buster gateway. The LonWorks network variable input data structure is dispersed to multiple data objects. These data objects are, in turn, made accessible as Modbus registers after appropriate data scaling and reformatting. The process is reversed for structured network variable outputs, with multiple data objects (Modbus registers) collected up and formatted into a single LonWorks structured variable. Contains configuration tool software, USB driver, documentation. XIF files are generated by the configuration tool. Introduction to Modbus, including function codes, exception codes, register numbering. Basic overview of LonWorks, and "why is it so complicated?" Videos - It's Easier than Reading! Watch these videos for an introduction to configuring the gateway. It's easier than reading! Our most extensive technical support is provided by the same engineering staff that developed the products. Your personal attention from this staff is available via the support ticket system.